MOUNT GILEAD — Dixie has turned in her badge and finished her final shift. 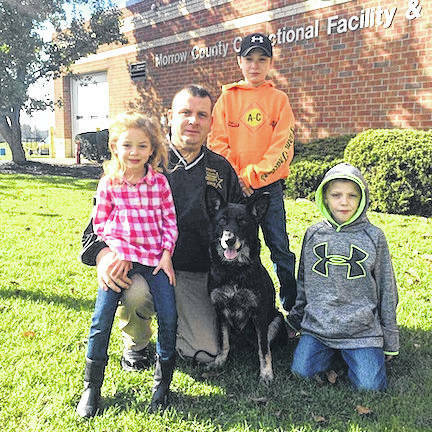 The Morrow County Sheriff’s Office held a retirement party, including punch and cookies, for the 8-year-old K9 officer on Friday afternoon. “She has been on the road now since the end of 2010, beginning of 2011. She has lived with me and served with me,” said Sgt. Brian Newsome, Dixie’s handler. Newsome bought Dixie from the county for $1. She will live with him and his family. “We’ve been together on the road eight hours a day, five days a week. I couldn’t ask for a better dog; she’s very loyal,” Newsome said. He said Dixie has a passive personality. But she also was trained to do police work, including sniffing vehicles for drugs. “We did numerous car stops, tracks. She’s went out of county on call-outs before. She’s been through everything that I’ve been through the past eight years,” he said. Newsome thanked the community for doing numerous fund-raisers to help offset the cost of the program. Having a canine partner has been a wonderful experience. “It’s been an honor. Having a partner and just knowing she’s back there,” he said. The upside is Dixie will be waiting for him at home when his shift ends. Both Sheriff John Hinton and his chief deputy have been canine handlers, so there is a strong tradition. That tradition will be carried on by new K9 officer Stormy, handled by Deputy Andy Cotter. “She’s already started on the road,” Newsome said.